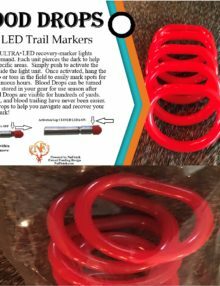 Blood Drops ULTRA LED recovery-marker lights activate on demand. Each unit pierces the dark to help you locate specific areas. Simply push to activate the LED stick inside the light unit. Once activated, hang the unit on a limb or toss in the field to easily mark spots for up to 20 continuous hours. Blood Drops can be turned off and easily stored in your gear for use season after season. Blood Drops are visible for hundreds of yards. Trail marking and blood trailing have never been easier. Use Blood Drops to help you navigate and recover your game in the dark! Sold 9 per pack.